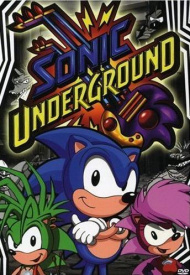 Sonic Underground - The Greatest Hits is the first musical release connected to the DiC animated series of the same name. It was included as a bonus fourth disc in the first volume of Shout! Factory's Sonic Underground DVD boxset, which contained the first 20 episodes of the series. It was followed up by a second volume in the next set released by the group. from "A Hedgehog's Home Is Her Castle"
from "New Echidna In Town"
Of the episodes this album came with, only the first four songs are represented, the remaining half of the disc featuring songs that would show up on Volume 2 DVD boxset. This page was last edited on 13 April 2018, at 11:17.